Unique 576 MGD emergency bypass aids in Missouri River flood relief. 2011 was a record-breaking year for floods. As spring turned to summer and snowmelt combined with seasonal rains, water began inundating the Midwestern and Southern United States. Much of Omaha, Neb., was in danger of catastrophic flooding as water levels in the river lapped at record highs. Any rainfall in the city and surrounding suburbs would back up in the city’s storm water system, threatening residents and businesses. These flows can be extremely dangerous and cause potentially serious health and safety hazards for sections of the city on higher ground not immediately affected by the raging Missouri River. Large and prolonged rain events in Omaha can cause estimated stormwater flows of up to 10 billion gallons per day. The city’s wastewater treatment plant struggled to deal with combined sewer overflow (CSO) from seasonal rains. As the river rose, the ability to discharge treated water was severely hindered. Meanwhile the College World Series of Baseball – a key economic and tourism event for the city – was scheduled to begin at a newly constructed stadium. The city did not want water to affect the games or the stadium and an emergency call was put in to Rain for Rent to help design a solution. The Power Prime DV600c handles flows up to 28,000 GPM and 4.5-inch solids through a 24-inch discharge and 30-inch suction. 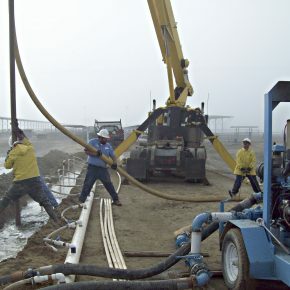 The ES600 is an electric submersible pump, capable of 17,500 GPM through a 24-inch discharge. The HD600 is a hydraulic submersible pump that discharges up to 19,000 GPM through a 24-inch discharge and submerses up to 40-feet. 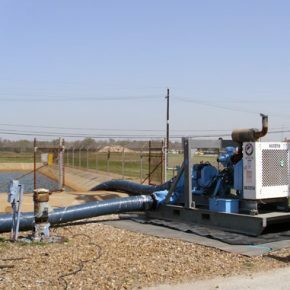 This first pumping station was put to the test almost immediately after installation as a three-hour rain event pushed CSO levels even higher. Rain for Rent’s first pumping station handled the CSO and was applauded by city engineers. At the second pumping station, a parking lot was demolished to access to large wastewater treatment plant culverts. 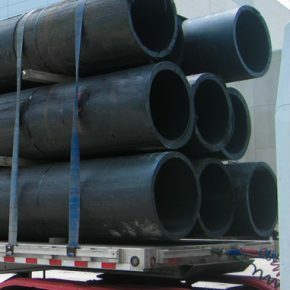 The tops were cut off these culverts to install four new FP-1050 floating pumps, three additional Power Prime DV600c pumps and another HD600 pump. 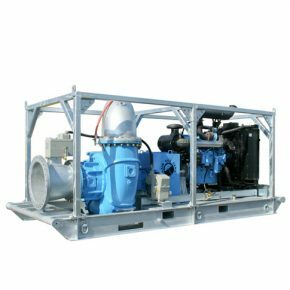 The high-efficiency, axial-flow FP-1050 is a self-contained floating pump station. This 42-inch pump meets Tier 3 emissions standards and moves up to 68,500 GPM of water and up to 27-feet of head. The floating pumps were floated in the culvert, rising and falling with the variable runoff flows. This second station handled up to 400,000 GPM and was estimated to have the ability to handle any 10-year rain event that could conceivably happen while the Missouri River is in a flooded condition. The CSO bypass pumping stations are expected to be in place as long as Omaha’s river remains swollen, which the Army Corps of Engineers estimates could take several months. At the beginning of July, water levels along the Missouri River in Omaha climbed to 36-feet with flows reaching over 216,000 cu ft per second (cfs). Normal July flows are around 32,000 cfs. Thanks to the nationwide presence and coordination of trained and experienced pumping professionals Rain for Rent was able to mobilize quickly in response to the emergency flood pumping needs throughout the Southern and Midwestern United States.